Fiberglass is a strong lightweight material and is used for many products. Although it is not as strong and stiff as composites based on carbon fiber, it is less brittle, and its raw materials are much cheaper. Its bulk strength and weight are also better than many metals, and it can be more readily molded into complex shapes. There is number of Applications of fiberglass. Other common names of fiberglass are glass – reinforces plastic( GRP) , Glass fiber reinforced Plastic (GFRP) or FRP . A slip ring is an electromechanical device that allows the transmission of power and electrical signals from a stationary to a rotating structure. A slip ring can be used in any electromechanical system that requires rotation while transmitting power or signals. 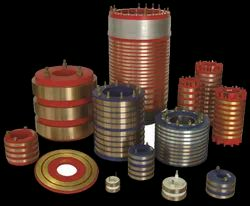 Product DescriptionOur supplied Slip Ring units are damage resistant and safe from adverse conditions. These rings give more reliability to the user by fulfilling all required needs. These slips are available in market in many technical specifications. All slip rings are accurate in dimension and can be customized as per unique necessities. Additionally, we have given fine finishing to all our rings.